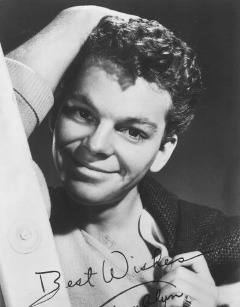 Russ Tamblyn is an actor and dancer, known for his early song-and-dance work in musicals like Seven Brides for Seven Brothers, Hit the Deck, and West Side Story. He began his professional career as a child actor, and ended in such schlock as Blood Screams and Attack of the 60 Foot Centerfolds. He was discovered at age 10 by Lloyd Bridges, who cast him in a play he was directing. In his first film, three years later, he played a friend of The Boy with Green Hair, Dean Stockwell. In his first starring role, he played The Kid from Cleveland, a runaway who becomes batboy for the 1948 Cleveland Indians (playing themselves -- Hank Greenberg, Satchel Paige, et al.). He was the boy with an unhealthy fascination with guns in the original Gun Crazy, and Elizabeth Taylor's kid brother in the original Father of the Bride. He starred in High School Confidential, as the tough-talking new kid in town, rumbling with John Drew Barrymore, "looking to graze on grass", buying heroin from Jackie Coogan, and receiving his aunt Mamie Van Doren's lascivious attention. He also played the six-inch-tall title role in George Pal's tom thumb, and he was Oscar-nominated for the steamy-for-the-50s Peyton Place, playing the boy wrongly accused of skinny-dipping with Lana Turner's daughter. In The Haunting, Tamblyn's character inherits the haunted mansion, and cynically dismisses all talk of ghosts. He also starred in one of the all-time great cheesy Japanese science fiction films from the legendary Toho Studios, titled The War of the Gargantuas in its American release. By then, Tamblyn knew he would never be Marlon Brando, and he decided to be more of an artist than just another actor. He fired his agent, took up painting, and began accepting only the roles that interested him. Among his best work from that time, he co-wrote and starred in an anti-nuke musical, Human Highway. He played Dr Jacoby on Twin Peaks, and later took the same character to General Hospital. Between acting jobs, Tamblyn has sometimes worked as a choreographer, beginning when he was an uncredited advisor to Elvis Presley for Jailhouse Rock. He worked with the dancers on the series Fame, and appeared in a few episodes playing "Russ, the choreographer". Stockwell and Tamblyn have remained lifelong friends, and also worked together on Another Day at the Races and Dennis Hopper's The Last Movie. Stockwell directed Man With Bags, a failed pilot for a Tamblyn sitcom, and Tamblyn guested on Stockwell's Quantum Leap.